I’m going to have another rant about school. I really like complaining. 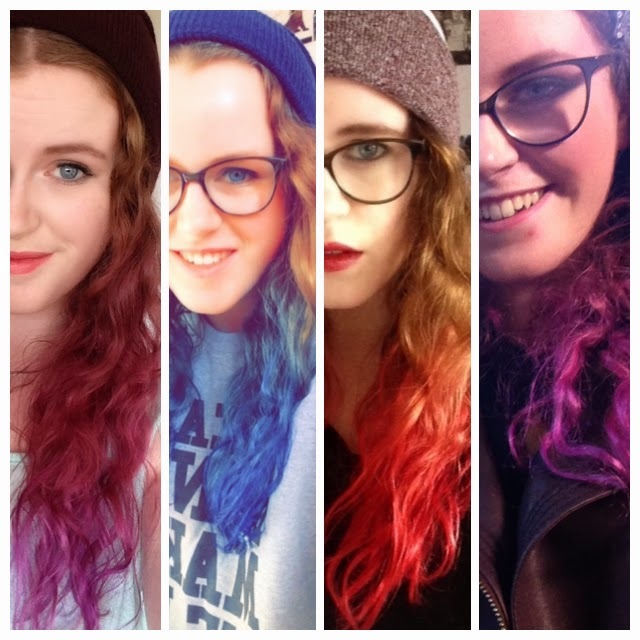 Between October and January, I dyed the ends of my hair about four different colours – it was blue, pink, purple and red. In January, during my mock exams, the Head of Sixth form, a very lovely lady, politely asked me to stop dying my hair because they didn’t want people in the sixth form to influence people in the younger years. She said she actually really liked my hair and didn’t see the problem, but she’d been asked to sort it out and so she must. I didn’t agree but I respect and like her enough that I stopped dying my hair. It was pink for a while until it faded and then I got my blonde highlights and most of the pink cut off so my hair is a completely normal colour now. I didn’t enjoy it – having coloured hair boosted my self esteem so much and I was really insecure about everything. I’ll be honest, my self-esteem regarding my appearance has been very low ever since but I’m just waiting till the day I leave school to dye it again. I can’t be bothered with the argument at school – I’m failing at least one of my subjects and I can’t risk being threatened with not being allowed to take my exams so I’m behaving and getting tattoo’s instead (next one in three days, I’m so excited!). But there is somewhere I draw the line. Why should I not be allowed to have coloured hair when someone else is not reprimanded when she dyes her hair blue? I like the girl in question – she’s in my English Literature class and she’s really funny, very edgy and somewhat intimidatingly cool but she seems to be allowed to have blue hair and I wasn’t. I don’t want to be the person that says ‘hey, why’s she allowed? !’ because what I want is for me to be allowed to dye my hair again, but what would happen is that she’s not allowed to dye her hair anymore. I don’t get it, I’m not happy about it but I probably won’t do anything about it because I don’t like confrontation. Maybe that’s why I wasn’t allowed coloured hair and she is. I don’t see why it’s an issue – it’s not distracting anyone, it’s not affecting my grades and maybe it ‘doesn’t look professional’ but this is a school not an office. Any office I go into would be an office that is tolerant of self-expression anyway. ← Page 86 of 365: How to make chocolate chip brownies!